Overwatch is a truly dynamic game, which means there’s always something new going on behind the scenes or in the community. Each week, we’ll have a round-up of the latest game news. That might be balance notes, character rumors, esports announcements, or just unmissably funny gifs. Here’s what Overwatch fans need to know for the week of July 31. The success of a team game like Overwatch does depend to some extent on good faith and good behavior. In a perfect world, everyone would follow the rules and play matches with a positive attitude. But the world is not perfect, and you will run into some players who bail on ranked matches because they’re losing, who bring hate speech into voice chat, or do other things to ruin the experience. Last week, a Blizzard community manager announced in the forums that the company will be making investments in better reporting and penalty systems over the next year. That kicks off right away with tougher penalties for verified reports of bad behavior. The company’s response to poor conduct might include silencing, suspension, or banning. That’s a nice development, but it’s still only on the PC version. PlayStation 4 and Xbox One players still have no options to report players to Blizzard. The company is aware of how frustrating this is for players; ranting forum posts on the subject are a dime a dozen. But the Blizzard is still working toward getting its own system in place within the Sony and Microsoft infrastructures. That’s not what a lot of people want to hear, and it’s frustrating that there’s still no console reporting after a year. But it is a timely reminder that a multiplayer game is as good as its people. So, you know, don’t be a jerk. Cool? Cool. For those who want to make this game their work and their play, the latest update about the Overwatch League has some very intriguing information. For starters, the minimum salary for a player will be $50K per year. Other benefits include one year guaranteed contracts, health insurance and retirement savings, and a large chunk of team performance bonuses. Blizzard has made it clear that they expect pro players to be treated and paid like the full-time employees they are. 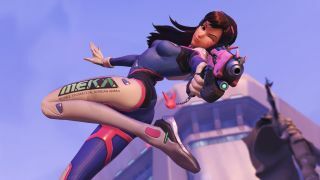 A lot of money (no, really, a LOT of money) is going into making professional Overwatch a serious sport on par with the NFL or NBA. Maintaining a high-profile pro scene alongside the needs of casual players will be a balancing act for Blizzard, but one we hope will create positive experience for all. That would be the ultimate win. Check back every Monday on GamesRadar+ for more Overwatch mayhem and magic.